Allen and Young Removals are a North London removals company, serving the whole of North London with our removals, packing and storage services. Based near the bottom of the M1, Allen and Young are perfectly placed to move your belongs to and from all parts of North London, and onward to the rest of the United Kingdom and Europe as well. Our convenient storage facilities are situated on the A406 North Circular, so we can offer the complete service: packing, moving, storage & return to suit your particular requirements, meaning you can relax while Allen and Young does it all for you. We can easily cater for short notice North London removals, and are more than happy to come out to your home for a personal survey too. 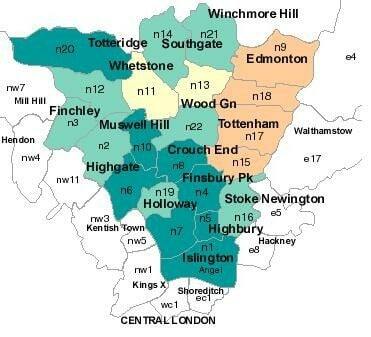 In addition to Removals in North London, we are pleased to be able to offer the complete range of our packing, convenient Storage, house clearance and an office removal service to all North London Districts and all the following postcodes: N1, N2, N3, N4, N5, N6, N7, N8, N9, N10, N11, N12, N13, N14, N15, N16, N17, N18, N19, N20, N21 and N22. Allen & Young Removals are fully insured and guarantee that you will receive a professional service at all times. Simply click on your area for further information.